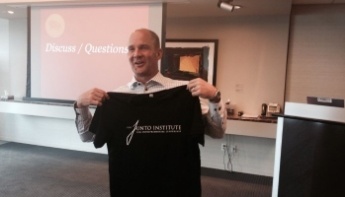 On Friday, we held our class on “Building a Sales Team” for the JuntoIII cohort. For the third straight year, the class was taught by Rich Lyons of LyonsCG, a full-service e-commerce development firm with over 300 employees worldwide. At the end of each JuntoClass, we ask our Apprentices to write down their key takeaways from the class as well as the actions they plan to take as a result of what they learned. Below is a sample from Friday’s class. In bold are the verbatim takeaways and action items from some of the Apprentices, followed by context and explanation, based on Rich's presentation. Incentives influence behavior. Salespeople will act or not act based on what their incentives are. Be sure the incentives you have are aligned with the behavior you want. “Everyone sells.” Build a sales culture where every person in the company knows their relationship to the top line and feels a responsibility to help it. It doesn’t mean that they necessarily sell, it’s just that they are customer-focused. People think the next sales hire will be their savior - it never happens so you have to change your way of thinking. This is especially true with the very first salespeople a startup hires. They’re often overpaid, often underperform, and are often undertrained. Rather than thinking about them being a savior, focus your attention on training and helping them become successful. Need to justify how much new and ongoing business we would get if we hired an account manager. Account Managers are often called “farmers” - they generate additional business from current customers as opposed to generating new business from new customers. When hiring one, think about where the revenue will come from. Comp plans should be related to activity, not just $$ amounts. Most companies align bonuses, commissions and other incentives to actual sales dollars rather than specific activities that can lead to sales numbers. Depending on the salesperson’s role (inside sales, outside sales, business development, account management, etc. ), compensation should take into account the specific activities that role is responsible for, in order to generate the sales numbers. Create compensation structure that benefits both salesperson and organization. It’s commonly said that a salesperson should make the most money in a company but this holds only if their compensation is tied to results. If so, then it’s a win-win proposition: the company benefits from high sales, and the salesperson benefits from high income as a result. Track my weekly sales activity. Every day (and I mean, every day), Rich logs the phone calls, emails, meetings, etc. that he makes in a notebook. He tallies them up at the end of the week and integrates them with his entire sales team’s data for their weekly sales meeting. Now that’s leading by example. Refine our scorecard - be able to actually quantify how much a phone call or a meeting is worth. Take annual sales and divide by total number of phone calls or emails or meetings. Voila. Start paying myself commission. If the salespeople in a company are partially or fully compensated by commissions, and the CEO is also responsible for sales, shouldn’t s/he be on a commission plan as well? Discuss if support can contact old leads or those who didn’t convert. Just because a potential customer didn’t want to buy at a particular point in time doesn’t mean they don’t want to buy now. It’s important to go back to old leads, dormant proposals, and other former opportunities...you never know where a sale may come from.